Starlux Games was founded on the belief that children, teenagers and adults alike can activate their imagination and sense of adventure through authentic real-time play. The modern world is full of screens and distractions of all kinds. As a result, we sit inside our houses, more engaged in the latest episode of House of Cards than we are to our own personal development. The detrimental effects this has on our social skills, our levels of exercise, and the diversity of our experiences is profound and well documented. Yet individuals who have ever been to a summer camp or similar will almost always report having one of the best times of their life. It’s why campers return to them year after year. And it’s because they are engaging their minds and imaginations, where they are experiencing camaraderie and learning new activities, and being forced to interact with others with different personalities in constructive and life-enriching ways. 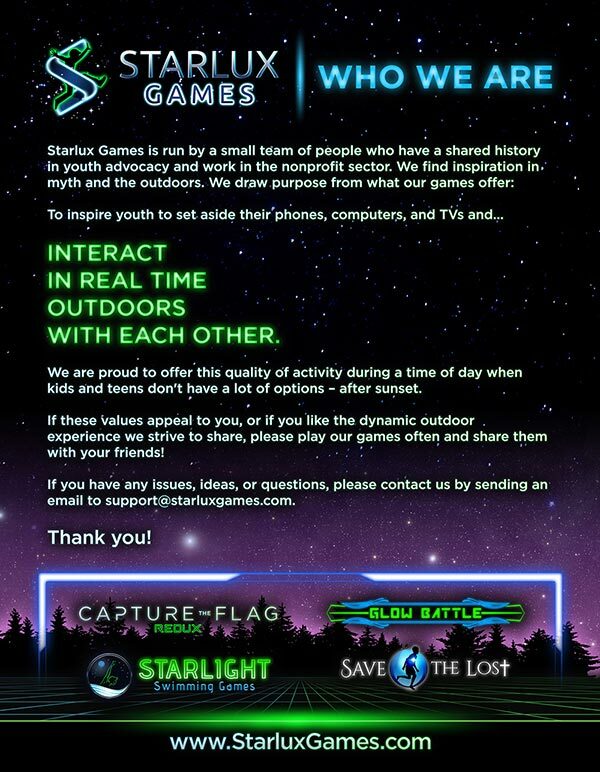 Starlux Games wants to bring the fun of youth group games and the imagination and sense of adventure they engender to our ever day lives. 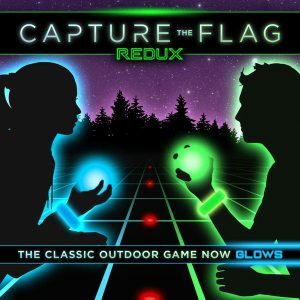 We put a new twist on Capture the Flag by reimagining the classic outdoor game as a glow in the dark game, which we named Capture the Flag REDUX. On this website and blog we will be talking about our glow in the dark games, yes, but we will also be sharing other ideas to help pull us away from our screens and video games and smartphones, games and activities that we think will help ignite imagination, spark creativity, and help us all be more physically active. Return weekly to get the latest updates.